Leaks in your plumbing can be as minor as a drip from a supply line or as major as a broken sewer line flooding your house. Fixing these leaks after the fact can be expensive and inconvenient. Your best option is to take measures to prevent household plumbing leaks in the first place. Over time, the connections between supply lines and drains can work themselves loose. Once a year, go through your home and make sure those connections are snug. 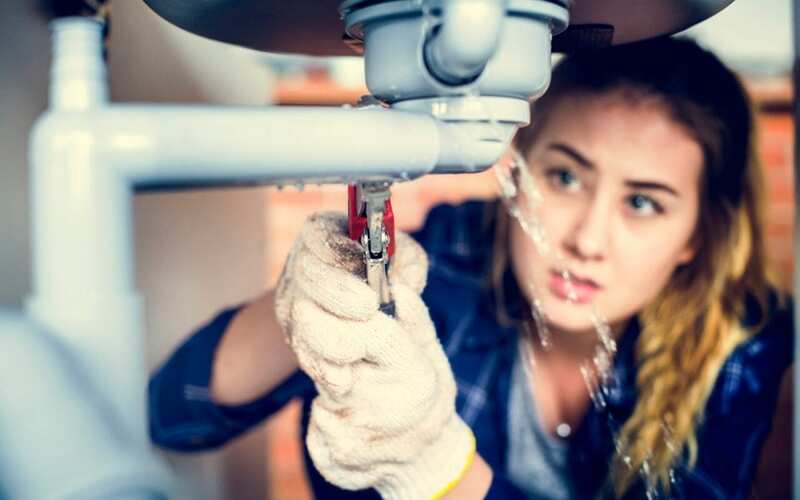 If you find a loose connection, use an appropriately sized plumbing wrench to tighten it. The connection should be snug, but not overly tight. Overtightening can damage the plumbing connection and create a new problem. Your washer hoses have to handle a lot of pressure passing water from your home’s supply lines to the machine. Over time, the rubber can start to deteriorate and crack. Once every few months, inspect the hoses for any problems. If you find a problem, replace both hoses. Even if the hoses have no damage, replace them every three to five years to prevent leaks. Clogs can put excessive pressure on your drain lines. This can lead to pipes cracking and connections failing. One of the main causes of household clogs is grease going down the trap. Drain all grease into a disposable container before washing pots and pans. Flush the drains with boiling water every few months to melt away any grease coating the line. Other substances to avoid putting down the drain include rice, potato peelings, and any oily or greasy foods. As a general rule, don’t put anything but thin, non-greasy liquids down the drain. Roots from trees can infiltrate sewer lines, especially those that are a few decades old. These tiny roots create a surface to which grease and other substances can cling, creating clogs. If a clog gets too thick, it could cause sewage to back up into your home. The best option is to prevent root infiltration by cutting down trees that are within 20 feet of those lines. Here is a list of trees that don’t usually interfere with the plumbing if planted over water pipes. In the bathroom, only toilet paper should be flushed. Do not flush sanitary products, cotton balls, paper towels, or any other items down the toilet as they can cause clogs anywhere in the system. If you live in an older home, have an inspection for your entire plumbing system at least every few years. The inspector may recommend replacing deteriorating pipes and bad connectors. Making these minor repairs can prevent major leaks from occurring. If you live in a climate where winter freezes are common, you need to take steps to prevent the pipes from freezing. Any pipes running through a crawl space should be wrapped with insulation. Any pipes on exterior walls also require insulation. AAA Home Inspections serves Central and Northern New Jersey with home inspection services. Contact us to schedule an appointment.